LTHForum.com - Big Jones--"Contemporary coastal Southern cuisine"
Big Jones--"Contemporary coastal Southern cuisine"
LTH Home > Chat > Eating Out in Chicagoland > Big Jones--"Contemporary coastal Southern cuisine"
We did brunch on Sunday (and it's nice that they that run until 3, we didn't get there until after 1). Great food, I need to try dinner there soon. 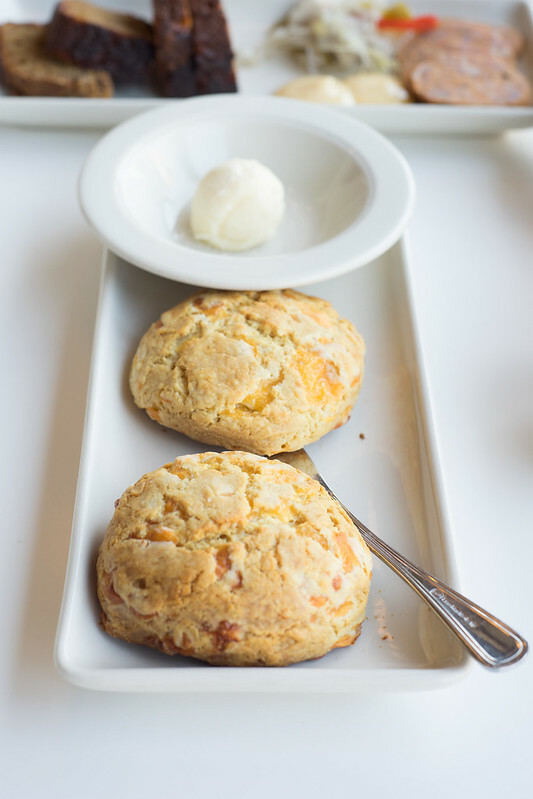 We ordered a pair of biscuits, tantalized by the leaf lard mentioned on the menu (and neither of us being biscuit and gravy fans, that's the only other place it appears on the menu). As I said in the Best Thing I've Eaten thread, it's like fluffy pie crust: heavy on the flaky, crisp exterior, yet still light and fluffy on the inside. A little sweeter than we make biscuits at home, and the blueberry preserves they provide, and maybe even the butter, are wholly unnecessary and possibly obscuring to the fantastic pastry. SueF wanted the Benedict, but they'd just run out of ham (how do you run out of ham?). She had the corncakes, which were more southwest than "coastal", and extremely delicious. Two poached eggs, avocado, spicy salsa, black beans and light corn pancakes. Very tasty. Thing2 and I had the New Orleans Eggs, which were two crab cakes topped with poached eggs and bearnaise. First of all, a shout out to their so-called O'Brien Potatoes. Man, those were some of the best hash browns I've had in a long time: crisp browned exterior and tender interior, almost a potato pancake, and not the lazy sauteed chunks of potato, onion and bell pepper you get at a lot of brunch places. The eggs were terrific, my only gripe is that there was an awful lot of batter on the crab, which didn't let the crabmeat shine. On the other hand, it made something a little easier to support an egg, more pancake- or muffin-like. Not the cheapest breakfast out there (we got out of there for $62 before tip with a beverage apiece), but far from the most expensive too. A gem in Andersonville. JoelF wrote: We did brunch on Sunday (and it's nice that they that run until 3, we didn't get there until after 1). Great food, I need to try dinner there soon. When I put on the butter, mine fell apart. And honestly, it was a bit hard for me to finish my entree after eating them. Still very very good. It is interesting and a bit sad for me to go here and think that it's easier to find authentic Southern food made with good ingredients here in Chicago than it is in many places in the South. mgmcewen wrote: It is interesting and a bit sad for me to go here and think that it's easier to find authentic Southern food made with good ingredients here in Chicago than it is in many places in the South. What a ridiculous statement. I'd love for you to back this up. Name all the restaurants that make authentic Southern food with good ingredients here in Chicago, and I'd be glad to throw 15 places from the South make authentic Southern food with good ingredients back at you for every single one in Chicago you name. Out of fairness, mgmcewen did not say that it's easier to find "authentic Southern, etc." 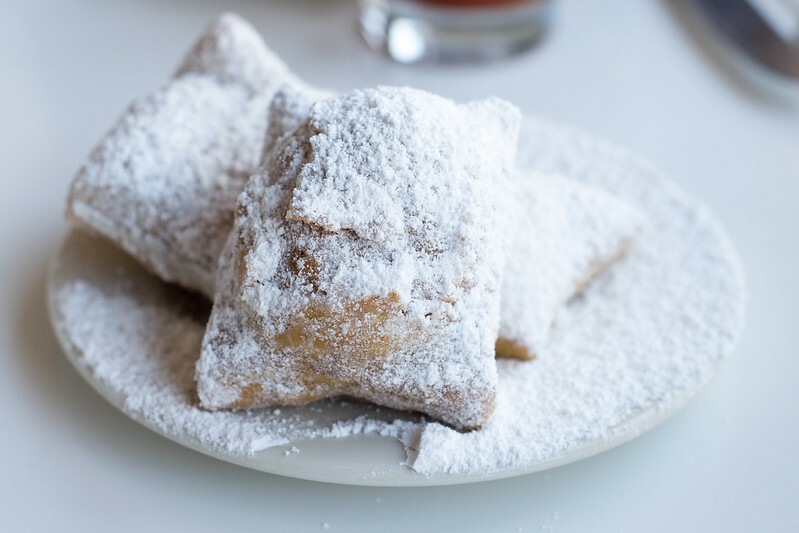 food in Chicago than in any place in the South, but rather many places in the South. That's a trivially true statement, of course (e.g., you could also safely say that it's easier to find a good Chicago style hot dog at one place in Florida than at dozens of restaurants that sell lousy hot dogs here in Chicago, and there are many small towns in the South and elsewhere with only fast food restaurants or no restaurants at all). But it's not fair to read mgmcewen as saying there are not also scores of restaurants in the South making food as good as or better than Big Jones; just that they are not ubiquitous. Perhaps mgmcewen and all of us could agree that, if you don't go to one of the "many" (hypothetical) locales in the South that just so happen not to have any restaurants serving "authentic Southern, etc." food, you certainly would find plenty of restaurants that do so in other Southern locales (of which I think there probably also are "many"). Now, let's kiss and make up. As someone from The South, like McEwen, I concur. She did not say Chicago has more Southern food than ANY place in the South nor did she say Chicago has more good Southern than the whole of the South. That would be stupid. But there are plenty of strip mall-blighted Sunbelt cities where the only country ham and grits you are likely to find come from the same roadside Cracker Barrels that we have. That's unfortunate and true. Edited to correct gender. Sorry. Last edited by JeffB on October 18th, 2012, 10:38 am, edited 1 time in total. It doesn't matter, because you'd be drawing from an ENTIRE REGION versus one northern city and that would still be fascinating to me. Don't get me wrong, the best Southern food is still in the South and there are restaurants and chefs there that are immensely talented. But they are largely concentrated in cities. When I visit family, I don't get to go to Charleston or Memphis or Atlanta, I have to go to blighted areas, often suburbanized, where traditions have been lost or hi-jacked by industrialism. Even worse, some people I am related to believe that traditional Southern food is "low class" and "unhealthy." The only pork available, for example, is factory farmed. Good luck finding non-hydrogenated lard, forget about leaf lard. My grandmother, of Bogalusa LA, was horrified I was even looking for it when I was visiting and wanted to make a pie for Thanksgiving. She uses margarine. My own experience is that you have to go to cities or the way way backwoods to get food that is actually "real food" and that reflects true Southern traditions rather than Paula Deen/KFC/Cracker Barrel. It is tragic to me that it is easier for me to cook with traditional ingredients in Chicago than it is when I visit family in parts of AL/MS/GA/AR. And that a restaurant that is set up to use them (whole animals that Big Jones uses) exists in Chicago and not in most places in the South. a friend and i visited big jones today for the boardinghouse lunch. i really love the idea of a meal served family style and the sides were terrific. but i learned it takes more than a humanely raised bird and leaf lard to produce great fried chicken. the bird, while crispy and grease-free was absolutely bland. it seemed as if no seasoning at all , not even salt and pepper, had been used to prepare the breading or the bird. my friend, who actually likes bland food agreed with me. such a disappointment.... the portion was generous, the housemade ginger beer fantastic, and the service was friendly and professional. but the star of the show failed to shine. Last edited by justjoan on October 24th, 2012, 7:47 am, edited 1 time in total. justjoan wrote: a friend and i visited big jones today for the boardinghouse lunch. i really love the idea of a meal served family style and the sides were terrific. but i learned it takes more than a humanely raised bird and leaf lard to produce great fried chicken. the bird, while crispy and grease-free was absolutely bland. it seemed as if no seasoning at all , not even salt and pepper, had been used to prepare the breading or the bird. my friend, who actually likes bland food agreed with me. such a disappoint.... the portion was generous, the housemade ginger beer fantastic, and the service was friendly and professional. but the star of the show failed to shine. For all of the great things Big Jones is doing (and they are doing great things), this consistency issue is very frustrating. I returned for the boarding house lunch and while all of the mains and sides were as terrific as they were on my first visit, we were delivered obviously burnt snickerdoodles. We were all full and didn't care and didn't comment to the staff, but you could smell how burnt they were, and portions of the cookies were close to black. In any event, there was no need to comment because whoever took these cookies out of the oven, and the waitress who served them to us, obviously knew they were burnt - simply no mistaking it absent very dark sunglasses. Chef told us that the recipe is based on the famous Edna Lewis recipe, so yeah, it was probably an unfortunate screw-up. According to Facebook the fried chicken will be available for dinner mon-thurs beginning tonight. Not sure if this is the whole boarding house meal or just the chicken. Either way it's exciting as it gives those of us without an opportunity to get there for lunch to have some. Had the Mardi Gras menu last night, or part of it since they ran out of it even though I mentioned it specifically in my reservation, which was a bit disappointing to say the least. The waiter apologized and gave us some champagne, but we never saw hide nor hair of any of the managing staff, which made me feel bad for complaining because it made me feel like I was blaming the hapless waiter. The whole staff seemed high strung and overwhelmed. I would say the overwhelming flavor of the food we had was fried, which is delicious at first, but then becomes monotonous. The gumbo was sadly kind of characterless, there was a chanterelle dish in an unflattering brown sauce that was kind of the same...it just didn't taste like much at all. I was baffled at the inclusion of cheesecake inside King Cake, which is already a very rich dessert. I do really really love the tasso ham with pimento cheese though and the shrimp had an excellent sauce. That's delicious. Overall though, I prefer Carriage House, as it is far less uneven. I'm so sorry that you missed out on some of it, Melissa. We loved everything, especially the gumbo. I thought was complex and had a really nice funkiness to it. I had never had a Piquant sauce before and I really loved it. I thought it had a good dose of paprika, but in searching for recipes I discovered that's not the case. I was baffled at the inclusion of cheesecake inside King Cake, which is already a very rich dessert. Not sure about what specifically was in the king cake you had at Big Jones, but cream cheese-filled king cakes are pretty common in Louisiana. It's not "traditional" (I believe adding fillings only started maybe in the past 30 years or so) and is not my favorite style, but seems to be a preferred option these days. I suppose if one wanted to nit-pick to the extreme, a filled king cake is not historically accurate for 1955 (wasn't the Mardi Gras theme a Cajun Family Meal ca. 1955 or somesuch?). Darren72 wrote: I'm so sorry that you missed out on some of it, Melissa. I don't know why I've never had a cheesecake filled king cake. My grandmother is from Lousiana, I guess she was a traditionalist. I'd certainly prefer a regular one given how heavy the entree foods are at Big Jones- the meal veered into Paula Deen territory. Had another stellar meal here - dinner apres theatre preceding Lifeline's production of "City and the City" based on China Mieville's book (brilliant story, production has some flaws but amazing they could adapt it at all). We started with the pickle platter. SueF was a bit disappointed that of all the pickled things, only one was actually a pickle (bread and butter). It also included sunchoke, chayote, chow-chow, pickalili, red onion, I think a shallot, and okra. Accompanied by bread and butter, it was a great start, all that acid waking up the palate. This was followed by their outstanding corn muffins and more butter (Unfortunately, no biscuits on weekends except for brunch. Must return for brunch or the weekday fried chicken dinner). We had a bit of a service kerfuffle: the noise in the place, even at 6PM, had the server hear our request for the "tasso" appetizer off the boucherie part of the menu as "cassoulet" off the veg/sides, and so we never got the tasso before our mains, and canceled it and the cassoulet, as after two bready courses we didn't think we needed it (but ended up ordering a dessert which we hadn't thought we would). SueF has the Sweet Tea-Brined Pork Loin, which was very tasty (although perhaps a little rare and a little less tender than I like), with a terrific sweet-potato hash and pureed baked beans as a sauce. I ordered the Crawfish Etoufee which was utterly delicious, and rather different from other versions I've had. Instead of a chocolate-roux, stock-heavy thick and spicy sauce with a lot of pepper, this was herbier (thyme mostly, I think), and quite bright with white wine. There's still some pepper to it, but it let the flavor of the mudbugs shine through. Hot sauce was provided (Crystal) but adding a vinegary sauce didn't enhance the dish. Loved it loved it. We were early for our show so ended up ordering coffee (a huge mug of Intelligentsia for $2.75 is a bargain), tea, and the peanut butter cake, which is baked fresh to order. A nice moist cake with a lot of peanut flavor, with a dulce de leche sauce and a spiced chocolate ice cream. The quite-spicy chiles in the ice cream combined with the peanuts made me think "satay" which is a little dissonant in a dessert, but it was a good choice: not overly rich and not overly sweet, a refined finish. Had my first taste of the much-loved Boarding House Lunch at Big Jones this week. The fried chicken was excellent. I mean, really, really fantastic. The crispy, corn meal crust clung perfectly to the well-seasoned bird. Unfortunately, the chicken was about the only thing well-seasoned that day. Actually, the chicken was the only worthwhile component of the meal. All of the sides (mashed potatoes with gumbo gravy, red beans 'n rice, voodoo greens, and even the corn bread) were woefully undersalted. The only thing that saved the greens from terminal blandness was the heavy dose of vinegar. I don't know. Maybe my body was just craving more salt than is normal, but even if so, nothing excuses the biscuit; a dry, raw flour flavored, inedible puck. But oh was that some delicious fried chicken. Come on, Big Jones. I know you can do better. The other night my wife and I set out down Clark street without much of a dinner plan. The weather was perfect and so we decided to try our luck getting an outside table at Big Jones. Lucky for us, there was a single two-top available. We split the small version of the fried chicken (half chicken and choice of two sides; as opposed to a full chicken with all of the sides) and a shrimp po'boy. The fried chicken was outstanding, both that night and for leftovers the next day. But everyone knows that already. But I've been dreaming about the mashed potatoes and gravy ever since. RAB, they must have seen your June post because our version was perfect. Had an enjoyable meal last night at Big Jones for our first visit. We were there right as they opened, so were the first diners. We ordered the potato and goat cheese croquettes, gumbo, and the pulled pork sandwich. The complimentary corn bread is a nice touch and is very good, especially with the delicious and plentiful butter served with it. The goat cheese croquettes were also very good (albeit relatively simple and not as tangy as I'd expect). The pickles they served with it provided that tang, though, and i though they were done very well. I did think the black bean puree was a bit odd, but the total presentation was really beautiful. The pulled pork sandwich was really incredible. Smoky, juicy, and again, the pickle slaw really added to this dish. The beef fat fries were also really good, although I only had two. Whatever ranch type dressing they served with it, my wife drank. Sorry, no pic, as it was gone in a heartbeat. The gumbo was a complete miss for me, as it was devoid of any flavor. I tried salting it, but it just didn't save it. The meat was also overcooked and dried out. Was surprised by this (and really disappointed, I'm craving good gumbo! ), but all in all, didn't detract from my overall experience that much. 4 of us had a terrific pre-dinner cocktail & snack session at Big Jones last night. Not only is their bourbon selection one of the finest in town, but their cocktails are delicious and accented by all sorts of thoughtful, house-made touches. Sage-infused gin, saskatoon berry syrup and paw paw orgeat were showcased in some of the cocktails we had. Longtime server Andy is now running the bar and he's got a very distinctive creative vision. 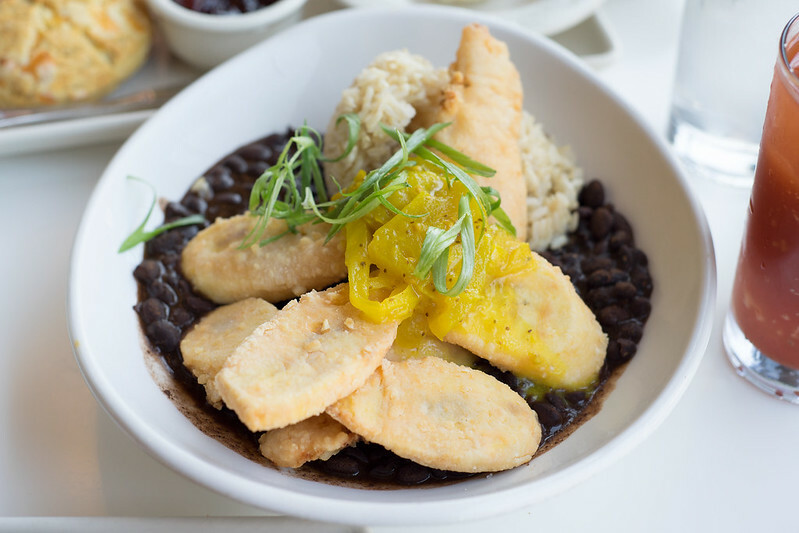 The combination of this vision, Big Jones' focus on historical culinaria, the overall asethetic chef Paul has established for Big Jones, plus the superior quality ingredients add up to a great and very interesting beverage program. Food-wise, snacks were stellar and paired up very well with the cocktails. The Pickle Tasting and Boucherie Board were both filled with all sorts of boldy-flavored treats. The Tête de Cochon was especially delicious, but really, the entire spread was terrific. 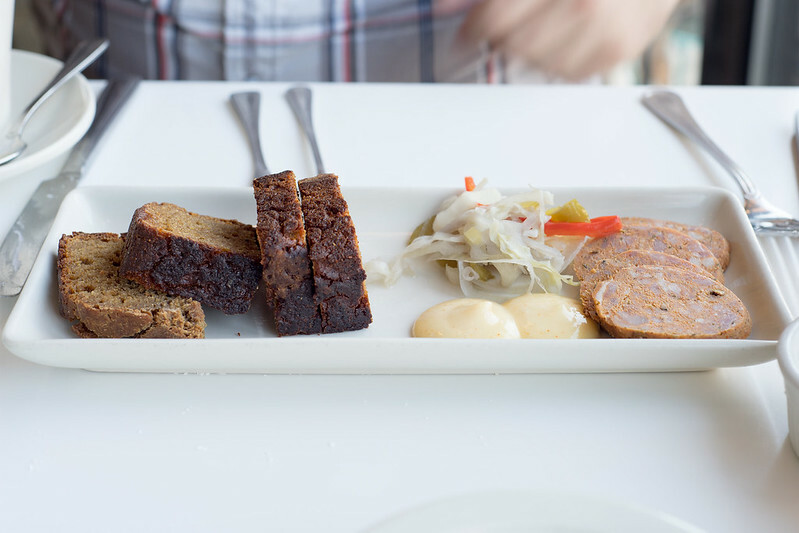 We also ordered some Cajun Liver Boudin Fritters, which were served with frisee, cayenne mayonnaise and piccalilli. We actually ended up with 2 orders because after we devoured the first set, the kitchen sent out a second because they felt that the first order wasn't hot enough. Yeah, we ate them all. After that, they sent out a dessert of paw paw panna cotta and spicy chocolate ice cream. I'm not normally a huge panna cotta fan but I dug the paw paw element quite a bit. I think Big Jones always has great ice creams and the one served here was no exception. It was terrific, with a great sweet-bitter-heat balance and flawlessly creamy texture. Service at the bar was friendly, enthuasiastic and to be perfectly honest, totally awesome. After we'd left and went to another neighborhood spot for dinner (a move the 4 of us probably all regret), in came one of the friendly Big Jones staffers with my wife's glasses in hand. She'd left them behind. That is going above and beyond, and says so much about just one aspect of why Big Jones is such a great place. The Tête de Cochon is stellar stuff, nicely seasoned and a great texture. 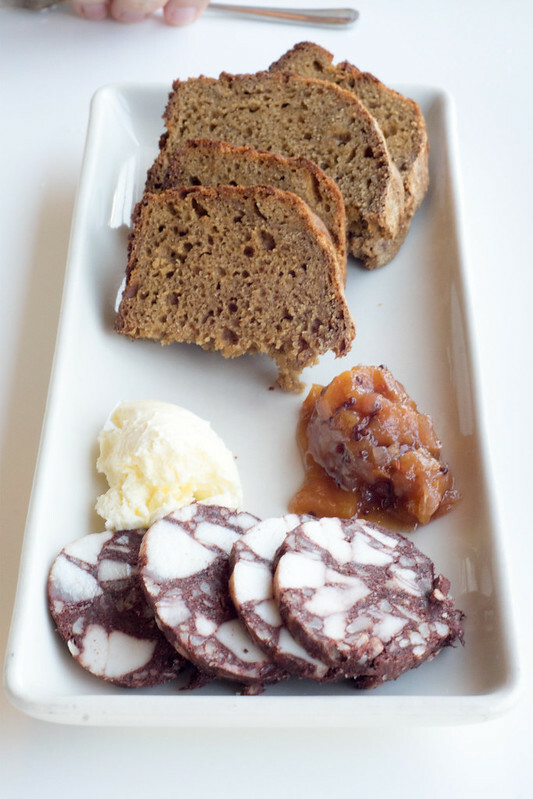 Big Jones puts obvious care into the accompaniments with their charcuterie but I preferred it straight up with rye. 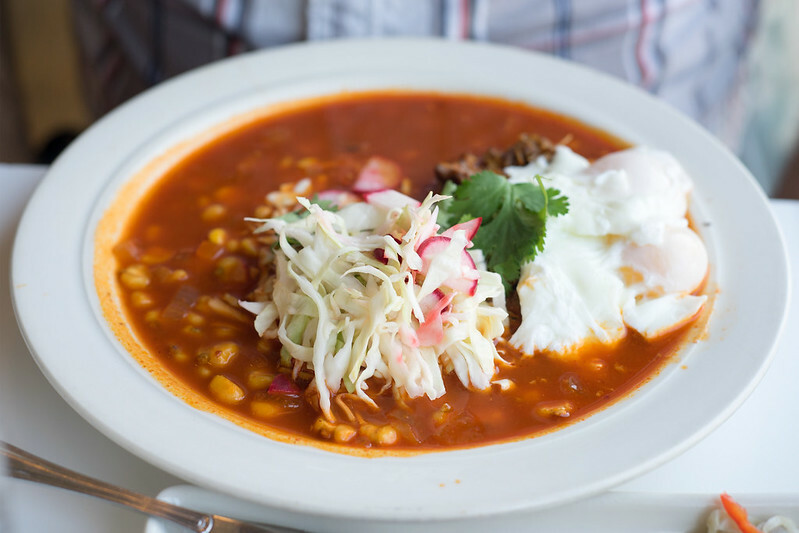 Also of a note, a recent brunch pozole rojo with smoked pork shoulder and poached eggs was another winner...rich guajillo flavored broth, firm hominy, and a great slaw with some beautiful watermelon radishes. I went there for lunch with my husband the other day and we got a family-style lunch based on 1930s-era recipes I think. I thought the whole meal was delicious, and I was really charmed. I love that the chef has such a sense of history. I have a love for historical cookbooks and I can't think of any other restaurants that relish historical cooking in this way. I could tell the chef here was a kindred spirit in that regard. As for the food, the corn bread was AMAZING, and the mashed potatoes and chicken were great. Only thing, the collards were a little vinegary for my taste. My husband's family is French and I can't wait to bring them there to get a taste of southern American cooking. The Boarding House special is no more. Chicken and biscuits and some a la carte sides remain on the menu. So sad. We heard a lot of people asking for it. Wonder why they discontinued it. I went to Big Jones this week for lunch and while the Boarding House special is no more, the fried chicken is still spectacular and a great value. For $15, you get half a chicken and your choice of three sides. And unlike the Boarding House deal, everyone at the table doesn't have to order it. Free from that constraint, my dining companion and I split the chicken and the shrimp burger, which I've never had there before. The sandwich has changed a little over the years and even now, is slightly different from how it's listed on the menu. The version I had came with lettuce, chow-chow, and what I think was a spicy remoulade. I can't say I get cravings for shrimp burgers all that often, but this was really great. I have liked many things at Big Jones over the years, but I've never had a perfect meal. Brunch last week did not change that, but we're getting closer. 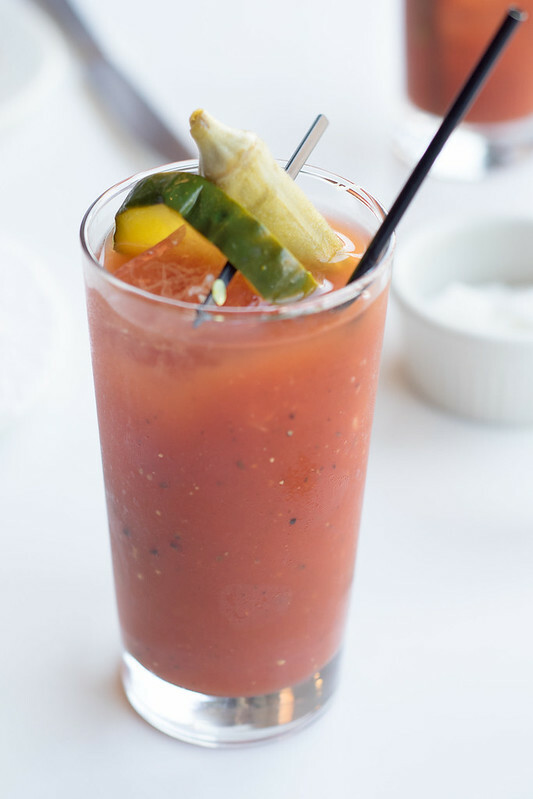 I love a good bloody mary, and though I prefer mine a bit thicker, Big Jones' is still a fantastic rendition. Though this wasn't my dish, I was able to partake in a few bites and I thought it was great. A bit too dry, unfortunately. Bland on top of bland. very lightly breaded, which became soggy sitting in the black beans. Perhaps it was taste bud fatigue at this point, but I was pretty jealous of my friend eating his pozole across the table from me. Damn. Still, this has been the best meal I've had at Big Jones so far, and I'm still very happy to have them in my neighborhood. I think I'm going to try and give that Boarding House lunch a go next time. Last edited by incite on August 17th, 2014, 7:51 am, edited 1 time in total. Are you sure the Boarding House lunch is still on? We were told it's no longer on the lunch menu. Sure was good while it lasted. Another great meal at Big Jones last night. Shared the pimento cheese starter. Mr. X had the Savannah Fish Fry (crispy catfish in a light corn and rice flour breading, served with creamy grits, hush puppies, greens, and oyster gravy). The hush puppies were the weak link on his plate. Didn't stop him from cleaning his plate. I went with the Fall Mushrooms (roasted chanterelles, chicken fried maitakes, creamy butterbeans, crispy Laurel Aged Charleston gold rice cake, pickled peppers), which was fantastic. Service was very good although there was a lengthy wait between our appetizer and entrees. Big Jones is a regular in our rotation for good reason. Man, does that sound good. Chicken fried maitakes are now on my must try list. It was a great dish. I cleaned my plate and I usually don't. I love the regular menu at Big Jones. For bunch, lunch, and dinner, it's one of my favorite restaurants in the city. From time to time, Big Jones offers special dinners in which Chef Fehribach gets a little more creative in his culinary exploration. Christmas Eve is one of those times. And last night, at the Creole Reveillon dinner, I had my best Big Jones meal so far. For all four courses, diners were given their choice of a few selections. Eager to try as much as possible, my dining companion and I agreed to split two appetizers, two mains, and two desserts. The appetizers we settled on were the Oyster and Carolina Gold Rice Perlau with House Vintage 2012 Country Ham, and Watermelon Molasses. I've never had raw oysters served any way but on the shell but they were great on top of the rice. The thin strip of housemade ham added a whole lot of depth of flavor and the watermelon molasses added a unique sweetness, although there's no way we would have identified it as watermelon. The perlau dish was really good but it was blown away by the Crispy Duck Liver with American Chestnut Grits, Stewed Gizzards, and Huckleberry Bounce. This dish was the highlight of the night and one of the best things I ate all year. From the chicken to the green tomatoes, Big Jones consistently shows a mastery of fried foods. That didn't chance a bit with the generous slab of liver in this dish. The chestnut grits were great, the stewed gizzards were the most tender gizzards I've ever had and were a really smart addition to the dish. I'd never heard of bounce before - apparently it's fruit preserved in booze and sugar - so I can't say whether this particular version was typical or better or worse than I would have otherwise expected. What I can say is that it provided a great component of not-too-sweet fruit that really brought the whole dish together. Honestly, the appetizers could easily have been main courses for a normal meal. But this was a Christmas celebration so it was on to richer foods following a salad course. Big Jones makes great gumbo. The holiday special - Heritage American Buff Goose Gumbo with House-made Chaurice Meatballs and Steamed Arkansas Delta Rice - might have been even better. Our bowl was a little light on the pieces of goose, but given that the tender meatballs were very present and very good, I didn't mind. The meatballs were a little different. There was definitely chili powder and cumin in there - enough that I joked they tasted like old school taco meat - but that's not remotely getting across the complexity of the flavor. The creamed venison and rutabaga pie, which was surrounded with fried kale, was the reason I wanted to go to this dinner and it didn't disappoint. I don't know how that venison was treated before going into the pie, but it was far more tender than I could have hoped. Speaking of tender, the pie crust, which I assume had lard in it, was sensational. The crisp kale added some salt and slight textural contrast, completing a dish that more than lived up to my high expectations. For dessert, we started with the rum & nutmeg bread pudding topped with a caramel sauce and was served with vanilla bean ice cream atop oatmeal raisin cookie crumble. This was a really, really solid dessert but not particularly memorable. I'm not a huge bread pudding person, so feel free to ignore my lukewarm endorsement. Also, to be clear, I would have happily eaten the entire dessert and taken seconds if offered. The cranberry and bone marrow pudding pie was spectacular. With each bite, the first thing I got was the hit of sharp cranberry which was followed by a smooth hit of the bone marrow pudding. I couldn't tell you what goes into the bone marrow pudding. There was definitely something sweet in there but there was no hiding the luscious bone marrow. This pie was ridiculously rich and was an outstanding finish to a really fantastic Christmas feast. I can't imagine not making the Creole Reveillon dinner an annual tradition.